For over 50 years, Cosmos Holidays has been providing quality but affordable holidays in Mexico. The Cosmos Mexico holiday programme builds on that expertise. Under the company's "packaged with care" promise, Cosmos offers a variety of good hotels in Cancun, Playacar and Playa del Carmen. Click the links to see the list, with latest prices. 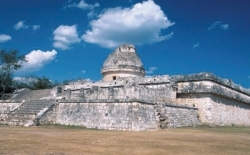 Mexico All Inclusive Holidays: Cosmos gives you great all inclusive holidays to Mexico. Amongst the choice of hotels are the Occidental Royal Hideaway, the Azul Beach Hotel, the Riu Caribe and the Moon Palace. Any of these will give you a holiday in Mexico to remember. Beyond All Inclusive - Other Hotels: As well as all inclusive hotels in Cancun, Cosmos also offers other hotels (even cheap or budget hotels) as well as self-catering options. Cancun is particlarly well-represented. This is a modern resort on Mexico’s Caribbean coast, with somewhere for everyone to see, and something for everyone to do. There is diving, snorkelling, and fishing: plus of course beach life and sun-worshipping. And you will not have to travel far to discover the many archaeological sites.